I think I've seen a Lego version out there as well. Fred's right. 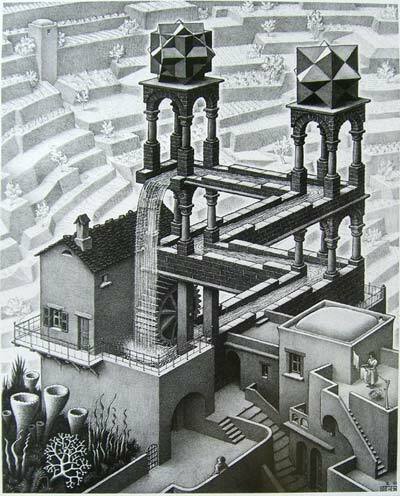 Not only the waterfall but other Lego realizations of Escher's work as well. Really cool stuff. One of my favorite Lego's BTW is the dominoes setter. You can see this on YouTube. How does that waterfall work? It looks like if it did work as shown, it would be a perpetual motion machine. There's gotta be a catch. The only problem is that I don't know what the catch is. It's a trick of camera perspective. If you look closely at the structure, you'll see that only from the camera's viewpoint will it look like it has height. In reality, the water is traveling pretty much level. Let it run for a while and it will slow to a stop.